The Shorthorn Insider is the official e-newsletter of the American Shorthorn Association. Sent bi-monthly, the Insider reaches over 4,000 Shorthorn enthusiasts. The Insider keeps readers up to date with changes and updates at the American Shorthorn Association. Three banner ad spaces are available in each issue. Ad spaces are $50/each issue. Ad spaces are available on a first come – first serve basis. Payment for the ad must be received before e-newsletter send date. Ad spaces must be reserved at least one week ahead of sending date. If you need your ad designed for you by the ASA, please contact the ASA two weeks prior to the send date. For any questions or to reserve your ad today, please contact the office at 816.599.7777. 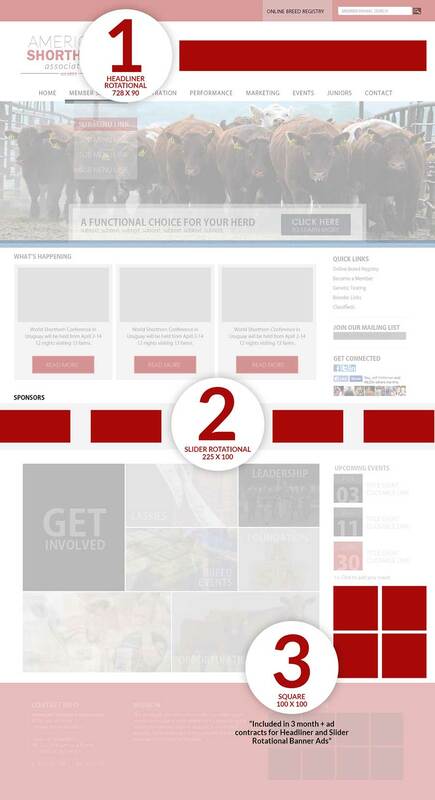 The state association coop advertising program is designed to help ASA and state associations share the cost of promoting the Shorthorn breed. Advertisement requests must be made by state association’s president, vice-president or secretary manager. Advertisements cannot be requested by groups of breeders or individuals. The ASA will reimburse 50% of the ad cost, up to a total of $650 per state per fiscal year. There are limited coop funds available for states in each fiscal year. No more coop ads will be funded when available funds have been utilized. Each state association must pay advertisement and send paid invoice to ASA to be reimbursed. ASA encourages the state association to include a copy of the ad placed with paid invoice. ASA will have 4 general ad choices and 2 contract ads for state associations to choose from. ASA encourages states to use contract ads for more Shorthorn promotion throughout the year. General Ads are a minimum of a quarter page in size and not larger than a full page in size. Contract Ads cannot be smaller than 1 column by 2 inches. Ads will have space to include the state association logo and contact information. Ads will include the ASA logo and contact information. Ads can include state events, dates and locations but not individual breeder information and dates. All ad requests must be submitted to ASA at least 5 business days before deadline. Ads will not be eligible for ad copy approval if received less than 10 business days before deadline. State Associations must provide the following ad specs to the ASA. State associations are required to meet above guidelines in order to be eligible to receive reimbursement for coop ads. Print advertising is available through the Shorthorn Country publication. Please keep in mind that the American Shorthorn Association is not responsible for the content of Shorthorn Country. You should understand that if you choose to conduct business with Shorthorn Country, you are conducting business directly with them.